How a social media campaign successfully rose awareness of domestic violence over the World Cup. It’s said that madness is repeating the same action, over and over, and expecting different results. 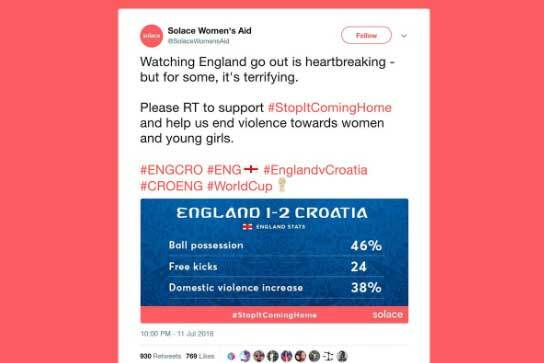 But after our recent domestic violence campaign for Solace Women’s Aid, I’d say madness is trying to get English fans to retweet #StopItComingHome during the World Cup. Turns out they’re a superstitious lot. So, why choose such a stupid hashtag for our campaign? Well, it certainly wasn’t because we wanted things to go smoothly. And definitely wasn’t because I’m Irish and genetically predisposed to hate the English football team – that’s just a coincidence. It was in fact because of this study from the University of Lancaster – that found that domestic violence went up by 26% when England play. And by 38% when they lost. Obviously these statistics are mind-bogglingly horrific, so we wanted to try and help Solace Women’s Aid do something about them. Recent online movements such as #MeToo and #TimesUp proved that if you can get people talking about an issue, you can get people to change their thinking – and ultimately their behaviour. So we wanted to get people talking about these stats. Not a shocking image. Not a celebrity spokesperson. Just stats. We kicked things off (sorry) with the first Belgium game and a simple idea – immediately after each England match we’d publish the official Fifa match stats and include the increased domestic violence stats with them. Then we’d tweet them to Gary Lineker and Rio Ferdinand and watch the RTs fly in. After all, who wouldn’t want to help a great cause like this? Turns out, pretty much everyone. It seemed that now the Lightning Seeds were getting their first royalty checks in 20 years, no one wanted anything to do with #StopItComingHome. "Maybe it sounds anti-England?" "Maybe it’s too confusing?" "Maybe it’s just a sh*t hashtag?" Lots of reasons were offered internally as to why we the campaign wasn’t catching on. So for the Colombia game, we decided to make a few changes. Moderate success, and a slightly improved uptake. But also, a bit of luck. 8 Outdoor Media took a shine to our campaign and wanted to get behind it (massive thanks to Fiona Ravlic at 8 Outdoor and Kerry Fyans at The Gate London for that!). Suddenly #StopItComingHome would be appearing on 38 outdoor sites across the UK for the rest of the World Cup – maybe it wasn’t such a sh*t hashtag after all. Following the Swedish game, smashed ambulances showed the ugly side of England winning – which led to even more people getting behind our campaign, including prominent Labour MP Stella Creasy. Then, the big day. Croatia. A World Cup final beckoned, and the chance for glory immortal. Sadly, it wasn’t to be (don’t tell anyone, but I was actually a bit gutted that they lost). But there was a massive upside to England being out – suddenly our hashtag wasn’t taboo anymore. Within minutes of the final whistle, The Guardian’s Owen Jones got behind the campaign, and with his help, hundreds of heartbroken English fans made it the 6th highest trending topic in the UK that evening – amazingly sitting one spot higher than #WorldCup (but obviously nowhere near #LoveIsland). By the time all was said and done, the campaign had generated nearly two thousand tweets and had been seen by over three million people, and even translated into Farsi – with no spin, no budget and no shock tactics. But despite the success of the campaign, unfortunately domestic violence doesn’t end with the World Cup. Government statistics tell us that two women are murdered and three commit suicide every week in the UK as result of domestic violence (yeah, seriously). So please donate, campaign or do whatever you can to support Solace Women’s Aid and everyone else who’s working in this area, and help them end violence against women and children, football related or otherwise, for good. If you, or someone you know might be at risk, please get help today – by visiting solacewomensaid.org or calling 0808 802 5565.